In large bowl, beat shortening with electric mixer on medium speed 30 seconds. Gradually add sugar, about 1/3 cup at a time, beating well after each addition and scraping bowl occasionally. Beat 2 minutes longer. Add egg whites, one at a time, beating well after each addition. Beat in rum exract. On low speed, alternately add flour mixture, about 1/3 of mixture at a time, and milk, about 1/2 at a time, beating just until blended. Stir in pecans. Divide batter evenly among muffin cups, filling each with about 3 tablespoons batter or until 2/3 to 3/4 full. Poke tops of cupcakes every 1/2 inch with long-tined fork, wiping fork occasionally to reduce sticking. Place cupcakes in dessert cups. In small bowl, stir sweetened condensed milk and coconut milk with whisk until smooth. Slowly spoon 2 teaspoons milk mixture evenly over top of each cupcake, allowing mixture to soak into holes and drizzle down side. Cover; refrigerate at least 2 hours or overnight, until milk mixture on tops of cupcakes is absorbed. In medium deep bowl, beat whipping cream and 1 teaspoon rum extract with electric mixer on high speed until stiff peaks form. 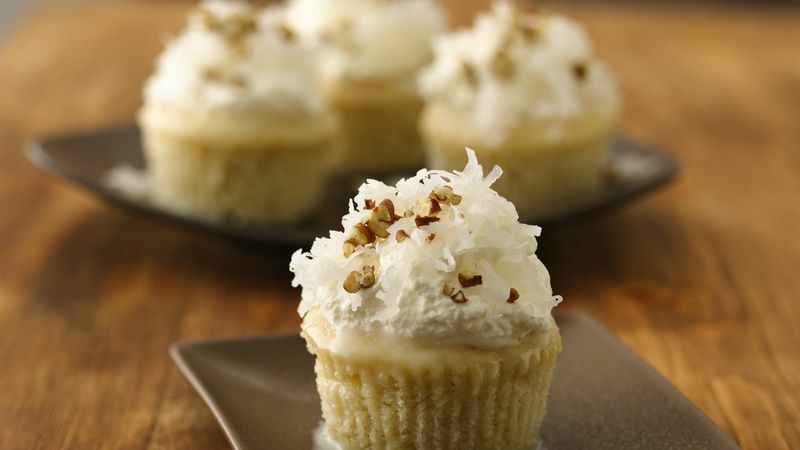 Frost each cupcake with about 2 heaping tablespoons whipped cream; sprinkle with about 2 teaspoons coconut and 1 teaspoon pecans. For fun, serve these delicious cupcakes in elegant dessert dishes.